Hamburg houses Germanys biggest port and has many sight seeing sites and things to do. You can take a boat cruise or enjoy any of the outdoor activities. Since Hamburg is a big city, a good way to move around is by renting a cheap car. Check our cheap rates on Rentalcargroup.com by doing a quote! Hamburg, the second largest city in Germany, is a very beautiful city. It is considered to be a great destination for holidays. This beautiful city also holds the distinction of being the sixth largest city in the European Union and the second largest port. Known for its historical buildings, museums, theatres and many other attractions, Hamburg is visited by thousands of visitors every year. It is also the media hub of Germany and a major commercial centre. Car rental is highly recommended to the visitors who want to know more about this great city. There are a number of beautiful places in Hamburg. You can find some beautiful lakes and rivers as well as a lot of wide-open spaces here. The large number of hotels and apartments in the city offer you great accommodation facilities. Every important place of the city is accessible through different modes of transport. The major attractions of the city consist of Alster Lake, Old Elbe Tunnel, Hamburger Dom, Schulterblatt Street, the Museum für Kunst und Gewerbe, Kunsthalle Glockengießerwall, the Deutsches Schauspielhaus and many others. With car hire at your disposal it is easy to get around these sites even if you are only there for a short time. Alster Lake or Binnenalster is a beautiful lake that can make your journey a memorable one. It covers a huge area of 400 acres and is a great place for picnics and summer strolls. Alter Elbtunnel or the Old Elbe Tunnel is also a must-see site. This famous tunnel connects the district of St. Pauli with Steinwerder Island. Hamburger Dom is an ideal place to spend a beautiful evening with the whole family. You can enjoy a lot of entertaining activities here and can also enjoy eating some traditional sweets on any of the numerous stalls of the place. The fireworks on Friday evening at Hamburger Dom are also very popular among the tourists. Mönckebergstraße is a main shopping area of the city where shopaholics can purchase a lot of things. The Hafenstraße or Harbour Street is also a famous place which is crowded by the tourists most of the time. Those who love to visit museums can go to the Museum für Kunst und Gewerbe, Glockengießerwall, where they can see a huge collection of works from all over the world. Furthermore, the tourists can also visit Ernst-Deutsch-Theater, Thalia-Theatre and The English Theatre of Hamburg to spend a beautiful evening. Hamburg car rental is just the thing for helping a holiday go smoothly. From the 1st of November to the 31st of March winter tires are mandatory in Germany. Most car rental companies have winter tires included in the rent price. When traveling we advise to carry some Euros to avoid any unwanted surprises. At Hamburg airport there are Money Exchange offices in order to change your local currency. The local time code for Hamburg is CEST. When traveling to Hamburg make sure to check the local weather conditions in order to avoid any unpleasant surprises. Hamburg has approximately 1,7 million inhabitants. Most major car rental agents in Hamburg Airport offer one way rentals. One-way rental is when you collect the car in one place and return the car in another location. In most cases the car rental agent will charge an extra fee if you wish to return the vehicle at a different location. In the terms and conditions will state if the one-way fee is included in the rental price. If the one-way charge is not included in the rental price, the one way charge needs to be paid on arrival directly to the car rental agent. Parking your rental car in Hamburg Airport can best be done in a garage. Its safer for you and your rental car. There might be the possibility to park your rental car in the outskirts of Hamburg Airport and move around by public transportation which is not too expensive and will compensate for the parking fee you will need to pay if parking in the city center. Take in mind that many big cities have a city center only accessible for locals or delivery purposes. The best way to explore Hamburg city is by taking the Hop on Hop off tour with a Double Decker Bus. Due to it many canals you can also discover the city by taking a Canal Cruise. 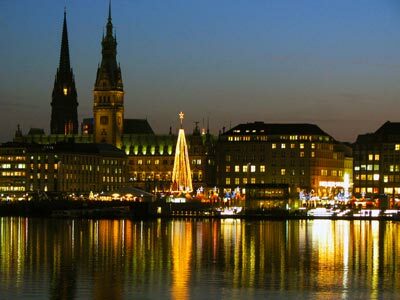 Hamburg has an excellent nightlife, on the Beatles Square you can find fancy restaurants and bars and night clubs. The old town of Hamburg has many attractions, for example the City Hall build in 1890. Art lovers should go to the Kunsthalle, there you can find paintings and drawings from famous European artists. Last month, the average car rental length at Hamburg Airport was 5 days. The average rental car length at Hamburg Airport is 4 days. The most booked rental car type currently at Hamburg Airport is MINI cars. Last year, the most booked rental car type at Hamburg Airport were ECONOMY cars. How much does it cost to rent a car at Hamburg Airport? Last month, the average car rental price was 79 USD. Last year, how much did it cost to rent a car at Hamburg Airport? Last year, the average car rental price was 125 USD. What is the current average daily price to rent a at Hamburg Airport? Last month, the average rental price was 16 USD per day. How much did it cost to rent a car at Hamburg Airport over the past 12 months? Last Year, the average rental price was 30 USD per day. The car rental companies available at Hamburg Airport are: Alamo, National, Enterprise, Interrent. See below last 5 customer reviews. Our customers rated Hamburg Car Rental with an average of 10.00 based on 2 ratings.